AeroQuick Compost Bin Speeds Up The Decomposition Process. 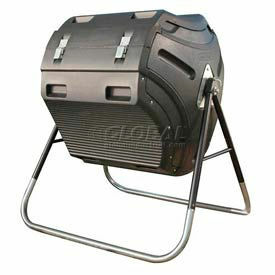 AeroQuick Compost Bin is made with industrial quality plastics for long lasting durability. Walls have a patented active aeration system that increases airflow for composition. 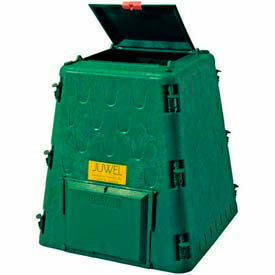 Made in Austria by the famed Juwel company, the durable bin will not break or fall apart. Hinged Lid has a sliding lock to keep larger animals out. Two access doors at the bottom provide easy removal of compost. 5 mm thick walls are held together with heavy duty snap-on clips. Limited warranty of 2 years is included. Capacities available are: 77, 110 and 187 gallons. Enviro World FreeGarden™ Earth Compost System Provides Economical And Ecological Compost Solutions For Homeowners And Gardeners. The FreeGarden™ EARTH is made of 100% recycled content. Animal and pest resistant lid twists provide variable ventilation control. Adjustable body vents allow regulated airflow. Available types are Combo Pack-Rain Barrel, Compost Bin with Base, Thermometer and turner, Combo Pack- Rail Barrel, Compost Bin, Thermometer and Turner, Compost Bin, Compost Bin Thermometer and Compost Turner. Accessories include Metal Grounding Pegs and Composting Guide Booklet. No assembly required. Single-unit main body construction provides easy instillation. Made with heavy duty, high density polyethylene panels that are UV protected this compost tumbler spares you the task of “turning" the compost pile. Available in 50, 65, 80, and 100 gallon sizes, each composter is black and built with double walled panels to absorb and retain heat which helps speed up the process of converting waste into compost. 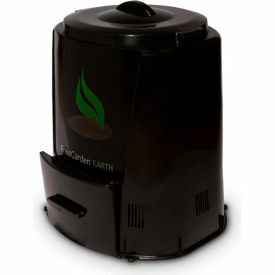 Each lifetime compost tumbler features a lightweight design and turns easily on axis for balanced rotation. The internal aeration bar in this lifetime composter is designed to mix compost and provide air flow. All hardware is included. Easy assembly. 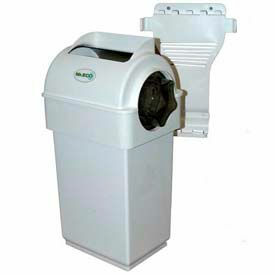 Mr. ECO Kitchen Compost Collector Conceals And Disposes Of Waste. Mr. ECO Kitchen Compost Collector is dishwasher safe for long lasting durability. Designed to be used with Biodegradable Composting Bags, but not required, the compost collector hangs from under-sink cabinet door and includes a tumbler to drop waste down into the bucket. Enclosed waste is never exposed to open air so flies and animals are not attracted by the smell. Unit includes a limited warranty of 1 year. Green unit holds 2.4 gallons and White unit holds 2.7 gallons.